‘DRONES’ by M-City available 15.00 GMT Thursday 25th June 2015. Exclusively from Edition Fifty in a strictly limited edition of 50, signed and numbered, 50 x 70cm, 3 colour screen print with tonal blend background on 320gsm Fabriano 5 paper. The 818th work by Polish Street Artist, M-City is an arresting print produced in collaboration with UK-based print studio, Edition Fifty. Expressing his horror at the indiscriminate effects of unmanned aircraft in modern warfare, the artist uses his art to rally against cowardly warmongers. A flock of drones, the likes of which are seen routinely destroying villages in Pakistan and Afghanistan, swarm across DRONES, a new print by Street Artist, M-City. More commonly found working to increasingly large scales – such as painting airport control towers and ships – the artist has been urged to commit his work to paper by Edition Fifty, the Bristol, UK-based specialist print studio. A false sense of security is imbued by the busy composition, rendering the killer aircraft largely unrecognisable as part of a pack until the viewer pays closer attention. The mass of wings and nose cones conceal the morbid danger of the weapons until the last minute, much like the last helpless moments of the drones’ real-life victims. The origin of the print lies in a wall painting completed in autumn 2014, the drones appearing in a Barcelona car park. 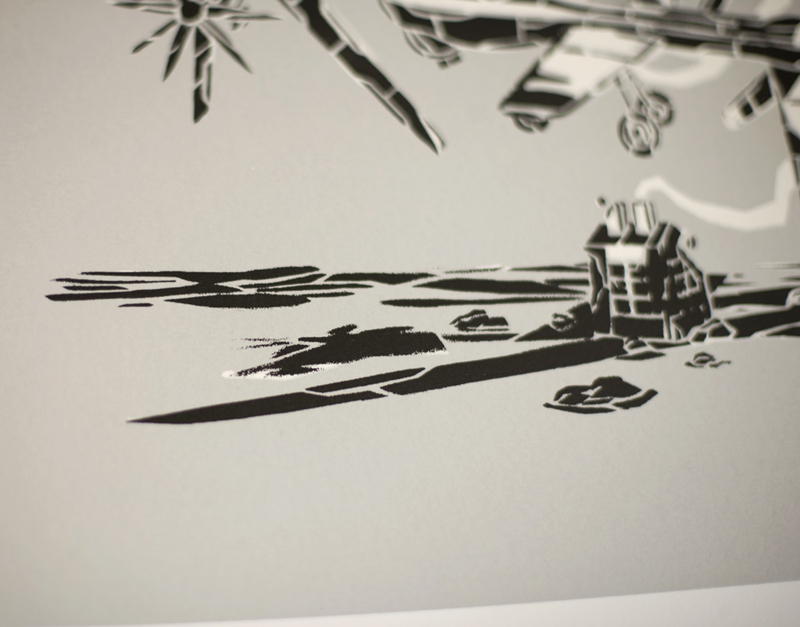 The vast, landscape piece has been condensed and refined for the purposes of the two-stage screen print, derived from the two-stencil original. The monochrome composition reflects the work that M-City is globally recognised for, providing sharp contrasts and textures with a minimal palette. As well as the spray can and craft knife, M-City draws on the internet and computer-aided design to plan and execute his precise paintings. Having seen much of Europe as an artist, including a standout piece painted for See No Evil in Bristol in 2012, M-City now travels further afield to find his inspirations, to be more frequently found in the poverty-stricken, but vibrant environments of Asian and South American inner-cities. Born and raised in Gdynia, northern Poland during the Communist era, the lingering taste of political dissent is never far from the artist’s mind or art. ‘DRONES’ by M-City will be available at 15.00 GMT on Thursday 25 June 2015 exclusively from Edition Fifty in a strictly limited edition of 50, 50 x 70cm 3 colour screen print with tonal blend background, printed on 320gsm Fabriano 5 paper. 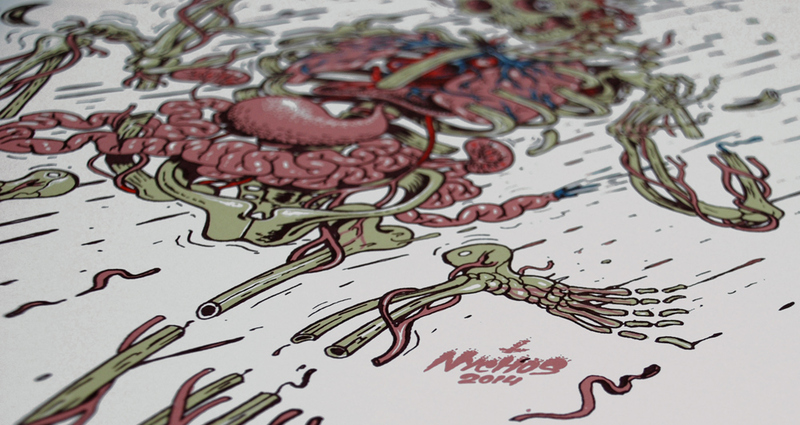 *Anyone ordering more than 2 prints will be refused sale and refunded. The Austrian urban art and graffiti illustrator Nychos was born in 1982 in Styria, Austria where he grew up in a hunting family. Getting confronted by the anatomy of dead animals at an early age and being an 80’s kid with an interest for cartoons and heavy metal ended up being some of the ingredients which inspired him when he started graffiti and painting at the age of 18. Over the years he developed a distinctive style which stands out - his dissections and cross sections of human and animal bodies are easily recognised. The focus and reinterpretation of dissected motives in a combination of colourful outlines can be seen as his branding. He is well known for his huge and technically outstanding art pieces in the urban environment as well as several gallery exhibitions. In 2013 he had solo shows in Detroit (Inner State Gallery), New York (Mighty Tanaka) and Turin (Galo Art Gallery), besides traveling the world, painting in over 15 different cities and participating in Art Basel Miami Beach, Pow Wow Hawaii and many other events. He’s currently seen as one of the most soughtafter artists of the street art scene. In 2014 three solo shows in San Francisco (Fifty24SF), Singapore (Mighty Jaxx) and Paris (Open Space) are planned amongst a set of festivals, events, conferences and fairs. Nychos is also part of international graffiti and urban illustration crews like “The Lords”, “The Weird Crew” and “The Jukebox Cowboys”.